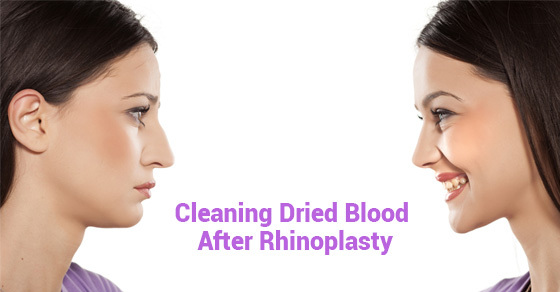 What Can Be Used To Clean Off Dried Blood Following Rhinoplasty? Recovery from rhinoplasty can be aided by keeping the area clean. Removing dried blood will help speed up the process. Follow your surgeon’s advice and DO NOT touch your nose until he/she says it’s OK to do so – usually when all discharge has stopped – about one to two days after surgery. Dried blood is common with this surgery. Most surgeons advise patients to use a saline nasal spray a few times a day and gently clean the area with a gauze pad soaked in saline. Saline spray helps moisten your nasal lining, which becomes dry from the surgery. Keeping your nasal area clean and moist will help it heal. Blood in the nose is normal after this procedure. It can collect around some of the stitches inside your nose. Keep your nose moist with petroleum jelly or an antibiotic ointment applied on the end of a cotton swab. Three times a day should do the trick. But always ask your surgeon first. Do not use any other spray but saline unless your surgeon tells you to do so. First though, clean your nose with peroxide-soaked Q-tips and with saline spray. Peroxide will help dissolve any dried blood while the ointment or petroleum jelly will help it from building up again. Keeping the area free from dried blood will not only speed up the healing process, but it will also make the area more comfortable soon after surgery. Any crusty residue will likely be gone by the second week at the latest. But keep using the ointment and saline spray. It will help the sutures dissolve when they should. Dried blood also makes it more difficult to breathe properly. Be gentle with the area and follow the directions your surgeon gives you for cleaning. Too much poking and prodding is not a good thing. If the issue becomes a problem, call your surgeon. The last thing you want to do is harm the incision site. Ask your surgeon when it’s all right to clean the area. The main thing is to be very gentle when doing so. Dr. Oakley Smith specializes in rhinoplasty. If you’ve been thinking about this surgery, he will be able to answer any questions you might have at an initial consultation. Contact his office for more information.